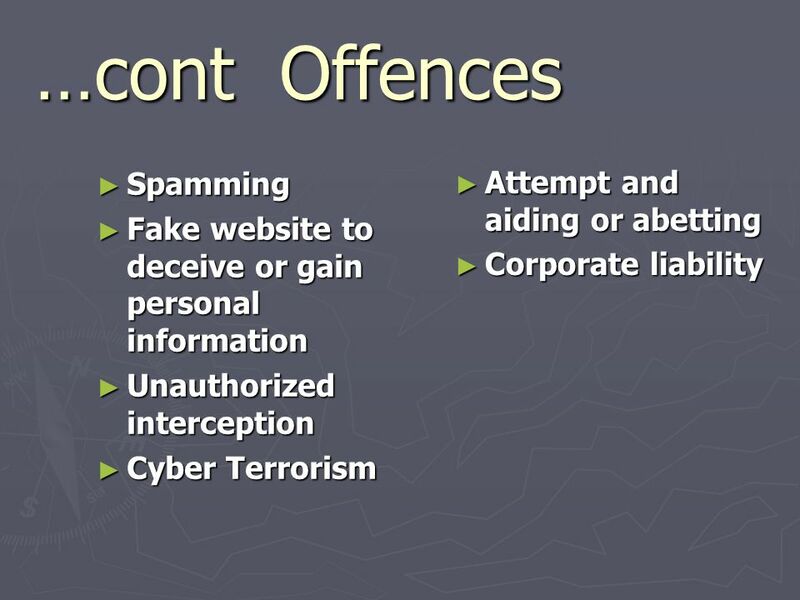 Efforts of Pakistan to Curb Electronic Crimes and Combat Cyber Terrorism Syed Mohammed Anwer Director Legal Ministry of Information Technology Government. 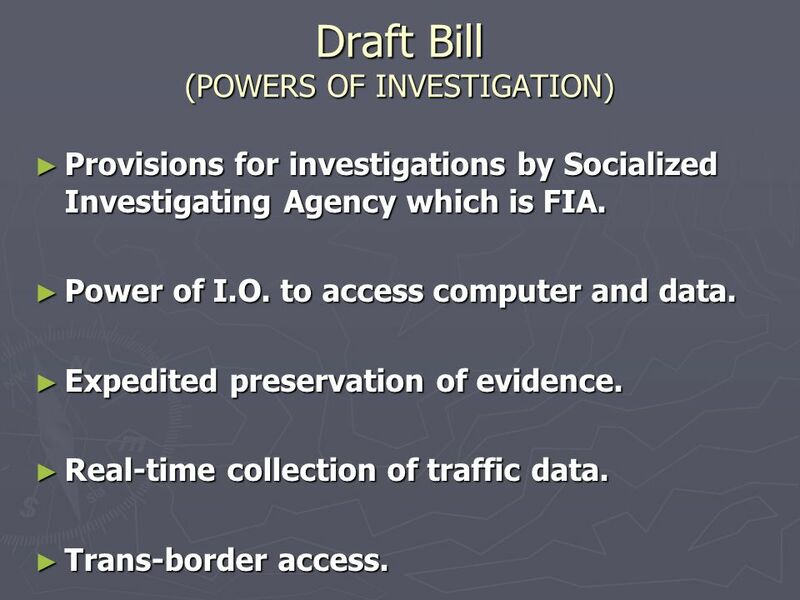 7 Draft Bill (POWERS OF INVESTIGATION) Provisions for investigations by Socialized Investigating Agency which is FIA. Provisions for investigations by Socialized Investigating Agency which is FIA. Power of I.O. to access computer and data. Power of I.O. to access computer and data. Expedited preservation of evidence. Expedited preservation of evidence. 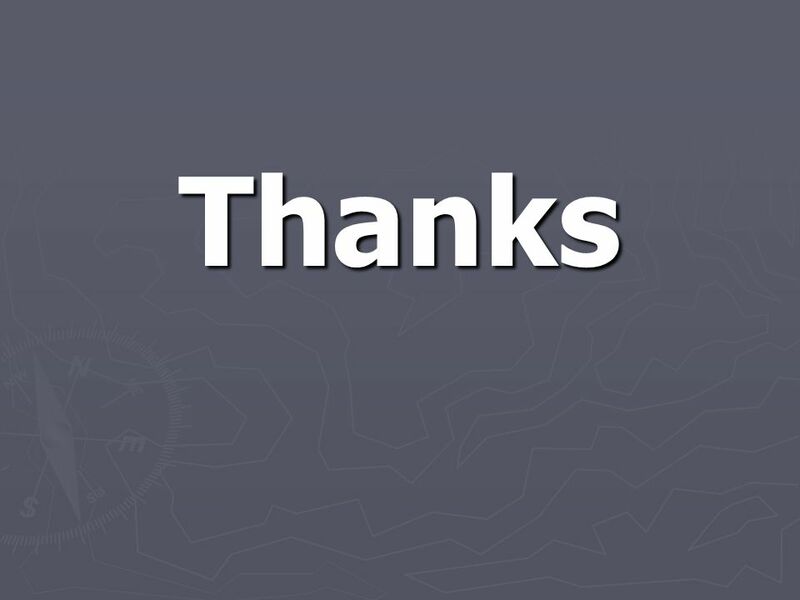 Real-time collection of traffic data. Real-time collection of traffic data. Trans-border access. Trans-border access. 10 What are Serious Crimes under this Law? Cyber Terrorism or Threat to Cyber Terrorism. Cyber Terrorism or Threat to Cyber Terrorism. 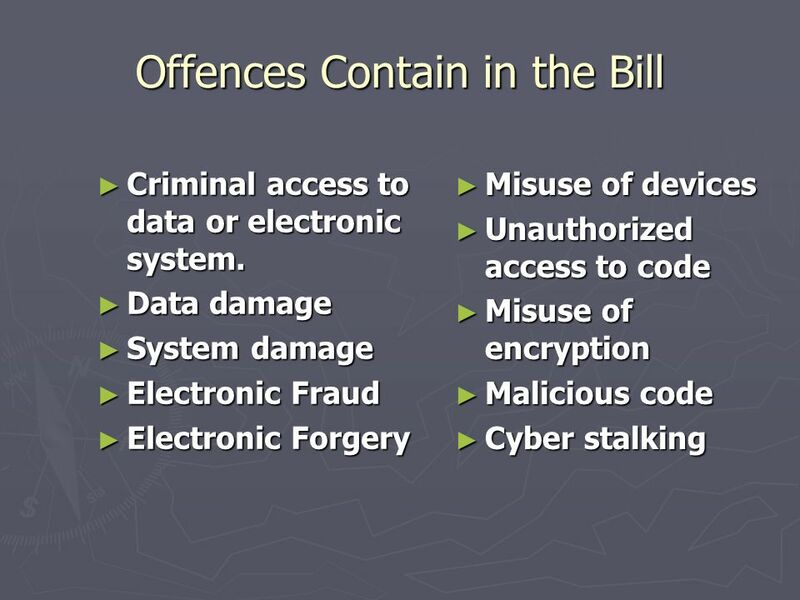 Electronic Fraud, Electronic Forgery and Cyber Stalking if committed with any Minor Electronic Fraud, Electronic Forgery and Cyber Stalking if committed with any Minor The Punishment of these crimes are 7 years imprisonment or more, they are non- bailable and non compoundable. 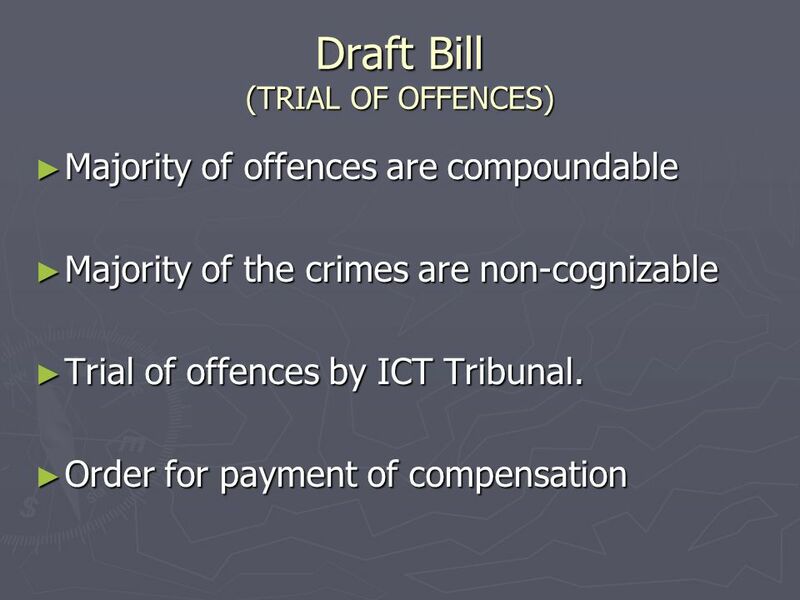 The Punishment of these crimes are 7 years imprisonment or more, they are non- bailable and non compoundable. 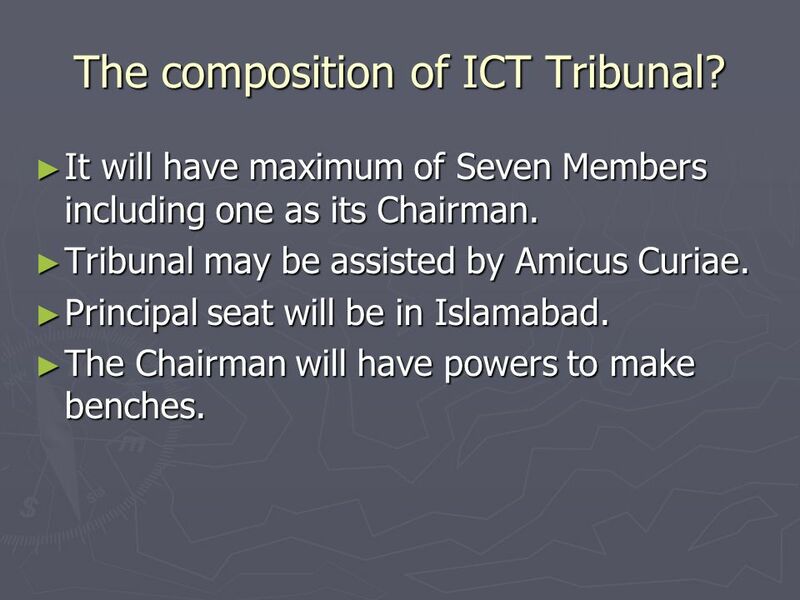 11 The composition of ICT Tribunal? It will have maximum of Seven Members including one as its Chairman. It will have maximum of Seven Members including one as its Chairman. Tribunal may be assisted by Amicus Curiae. Tribunal may be assisted by Amicus Curiae. Principal seat will be in Islamabad. Principal seat will be in Islamabad. The Chairman will have powers to make benches. The Chairman will have powers to make benches. 12 What Will be Achieved by this Law ? A sense of safety and protection will prevail in all sections of society that deal with IT. A sense of safety and protection will prevail in all sections of society that deal with IT. 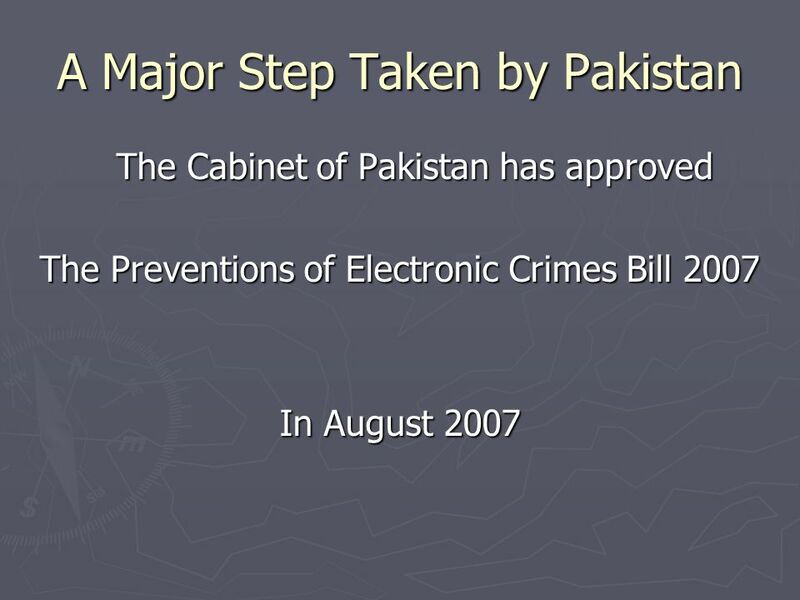 It will curb the electronic crimes in the country. It will curb the electronic crimes in the country. Pakistan will become more safe place for IT business. Pakistan will become more safe place for IT business. It will enhance confidence of our international partners in IT It will enhance confidence of our international partners in IT IT will provide safer environment for electronic transactions consequently boost e-Banking and e-Commerce in Pakistan. IT will provide safer environment for electronic transactions consequently boost e-Banking and e-Commerce in Pakistan. It will help Pakistan in moving towards paper free economy more confidently. It will help Pakistan in moving towards paper free economy more confidently. 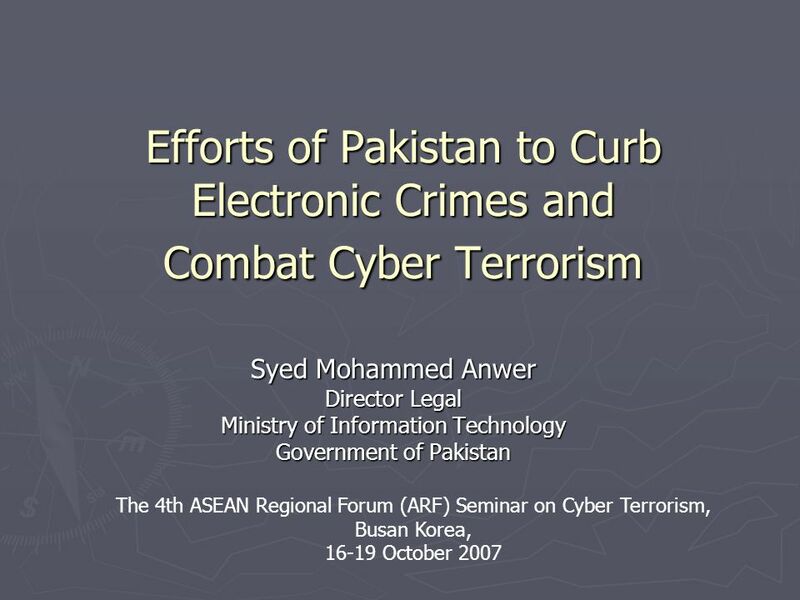 Download ppt "Efforts of Pakistan to Curb Electronic Crimes and Combat Cyber Terrorism Syed Mohammed Anwer Director Legal Ministry of Information Technology Government." 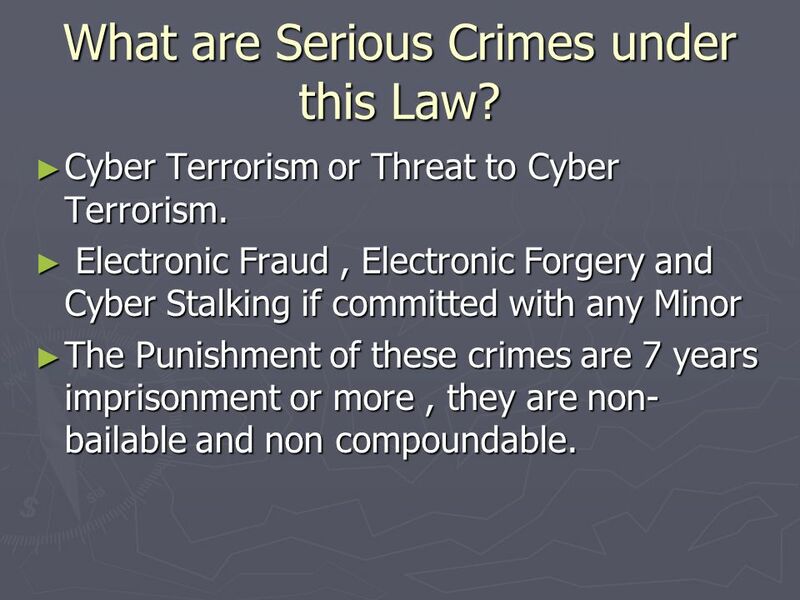 Cyber Laws in Pakistan Sehrish Mushtaq. Human Security Act of 2007 Protect life, liberty, and property from acts of terrorism. Condemn terrorism as inimical and dangerous to the national security. Narcotics Control in Korea prepared for ARF Seminar on Narcotics Control Sept. 20, 2007 Xian, China SEOL, JAE YONG Liaison Officer Security & Counter Terrorism. 1 ASEAN Regional Forum Meeting 28 – 30 April 2010 Bandar Seri Begawan, Brunei CERT-Ins Initiative on International Information Security Dr A S Kamble Director. International Telecommunication Union Support for Harmonization of the ICT Policies in Sub-Sahara Africa Name of presenter HIPSSA Project. International Telecommunication Union HIPSSA Project Support for Harmonization of the ICT Policies in Sub-Sahara Africa, Workshop on Tanzania National. International Telecommunication Union HIPSSA Project Support for Harmonization of the ICT Policies in Sub-Sahara Africa. Prosecuting a suspected case of illegal traffic Workshop for Central and Eastern Europe countries on the prosecution of illegal traffic of hazardous and. Rohas Nagpal, Asian School of Cyber Laws. 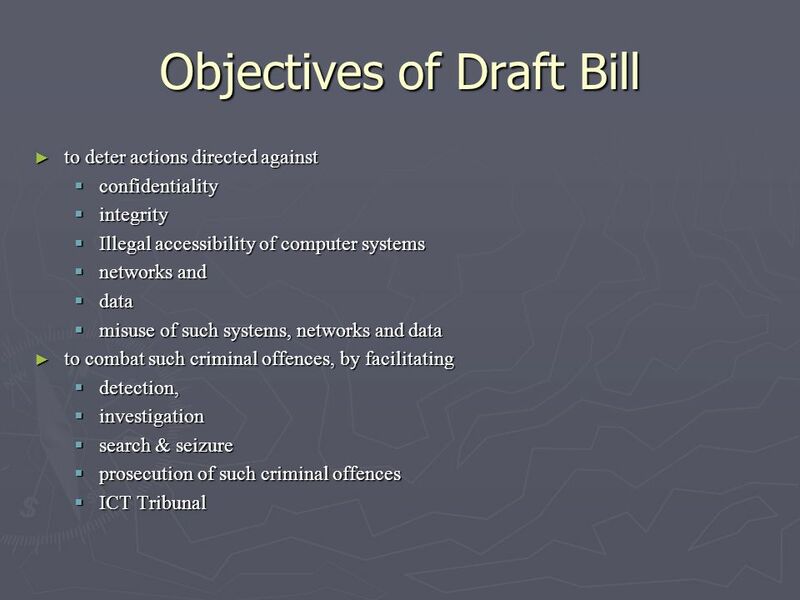  Information Technology Act, 2000  Imprisonment upto 10 years  Compensation upto Rs 1 crore  Indian Penal. 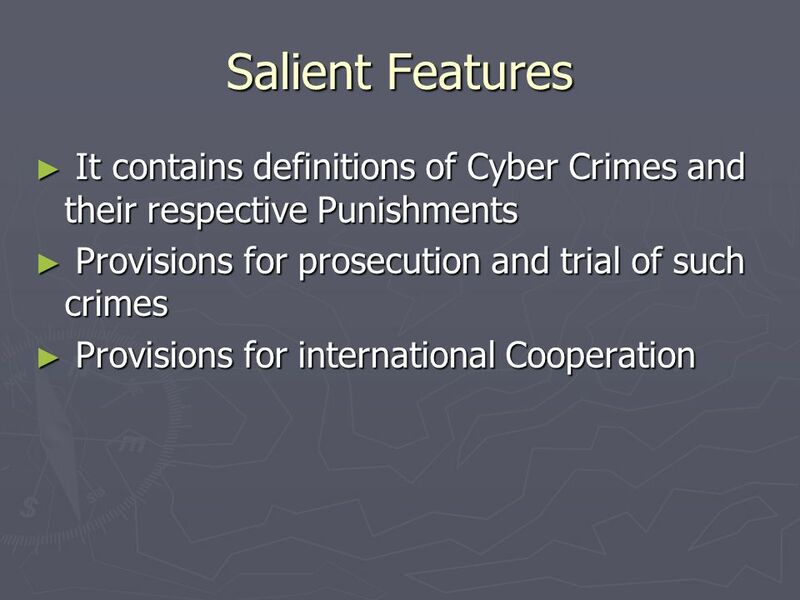 Cyber Law & Islamic Ethics CICT3523 COMPUTER CRIMES. 0 The United Nations The United Nations Strategy against Corruption and its Financial Channels Durban, October 1999. Legal & Political Issues in International Computer Crime Investigation & Prosecution Jennifer S. Granick m.
Copyright 2010, The World Bank Group. All Rights Reserved. Background and governance Part 1 Crime, Justice & Security Statistics Produced in Collaboration. Eneken Tikk // EST. 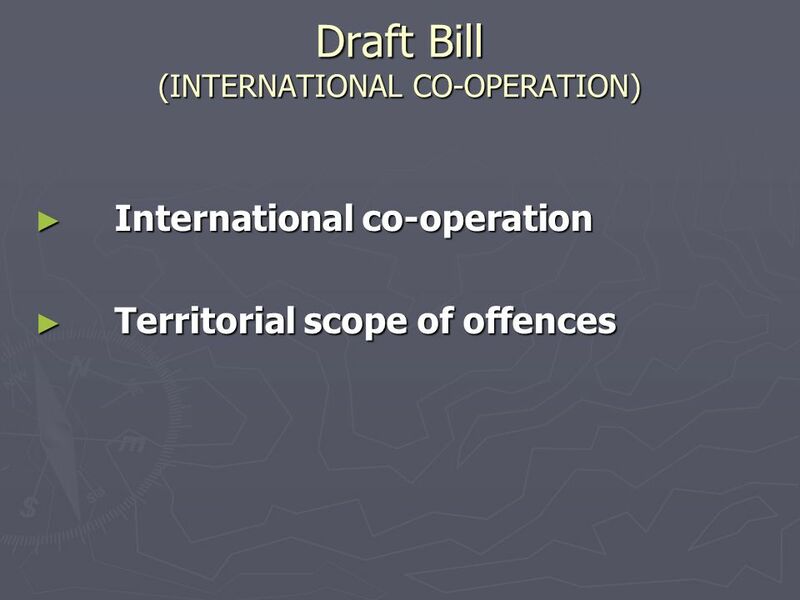 Importance of Legal Framework  Law takes the principle of territoriality as point of departure;  Cyber security tools and targets.